Whatever your requirements, Away With It have all the tools to help make house clearance quick and easy. House clearance can be stressful and we understand the importance of a prompt and expert service when handling your unwanted furniture and belongings. You will not need to lift a finger, simply leave it to our friendly team members to lift everything from old grand pianos to arm chairs onto our safe disposal vehicles. If you want speedy and affordable house clearance in Hornchurch, get in touch today! Why Choose Us for Hornchurch House Clearance? Are you dreading the day when you have to shift your old sofa in the back of a van? Are you unsure of what to do with your old kitchen units since your refurb? Whether an item is niggling you, or you want to clear an entire property, no job is too big or small for the Away With It team. If your old fridge freezer has just got to go, or you are sick of the sight of the old bunk beds, give us a call. We work from 7am to 11.30pm at night because we understand that we need to fit our service around you. There are commitments such as work and school that come first, but we can liaise with you to schedule in the perfect time. You will not need to rush your plans; we will always give you a call to let you know we are on our way. We have complete flexibility, offering quotes and collections seven days a week. As a result, no matter what your plans, we tailor our service to your specific requirements. Away With It have been proving house clearance in Hornchurch for ten years and locals are always recommending us to friends. We are championed for our seamless and friendly service, going out of our way to make sure you get the best from us. Our team will not only clear your house; they will always tidy up after themselves – it will be as if we were never there! You will be hard-pushed to find a higher level of service and we are also able to remove almost all non-hazardous waste. You don’t need to worry about where your waste will go once we have removed it. 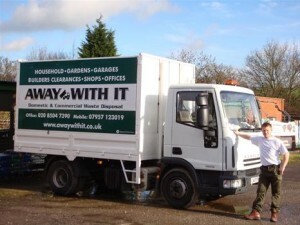 Away With It are fully licensed and insured waste removal experts. When clearing your house, we abide by all regulations and we have a green approach, recycling 80% of the waste that we remove. If you are on a strict budget, you will always pay the best possible price for house clearance in Hornchurch. Because we charge by volume of waste and not by load, our clearance services are often far more cost effective than competition providers. Whatever you need clearing, give us a call and one of our team will help create a bespoke service for you. We are able to take your call 7 days a week, morning, noon, and night. Feel free to ask as many questions as you like, and you are more than welcome to receive a no obligation free quote over the phone. To talk to a member of the Away With It team, give us a ring on 0208 504 7390.